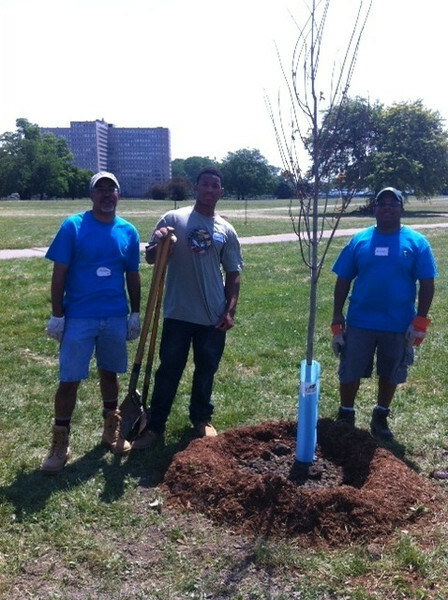 This past weekend I had an opportunity to volunteer with the Greening of Detroit planting trees at Erma Henderson Park and Marina. It is located south of East Jefferson next to the Jeffersonian appartments. This is where my uncle used to keep his boat but the marina is empty now. I was there because one of our boy scouts is doing this as part of his eagle project. Our troop turned out in force as did a bunch of my friends from work. It was very hard work. We had to dig holes about 2 feet deep and 4 feet in diameter. This would have been easy but the ground was dry, hard and rocky. My group got 2 trees planted. It was hard work but I will definitely do this again. When we arrived, we could see about a dozen old growth trees in the park but there were places where trees obviously should be that they were missing. All the teams working together in small groups planted about 20 trees over a period of about 4 hours. It was a very hot day and the work was very tiring. The spot chosen for us for our first tree seemed to be on top of a coal seam. Our second tree was easier but not much easier. I haven't swung a Mattock or Pick Axe so many times in years. Actually I think it was 2008 during community service conservation project at Philmont. We dug out the hole then rolled the root ball into the hole. It was too heavy to lift. We then leveled the tree by tilting it to one side and filling in a bit of dirt. We then cut the twine and pushed the biodegradable burlap down in the hole. We filled the hole, tamping down the soil as we went then built a small burm around the tree to protect it from the park lawn mowing crews and then we spread mulch over the burm, not touching the tree trunk. The last touch was a blue plastic label designed to protect the trunk but fall off when the tree grows large enough. Today I noticed an article about how to spot the difference between affluent and poor neighborhoods from space. Trees. Hopefully the Greening of Detroit is helping reverse blight that is not only economic but made worse by dutch elm disease. Read more over at Colorlines.com and Greening of Detroit.com.